The year is officially halfway over. Six months down, six to go. And while I’m pretty pleased with what I’ve accomplished during the first half of 2017, I feel like I need to pick up the pace just a bit if I’m going to get through my entire list of goals for this year (which you can see here). 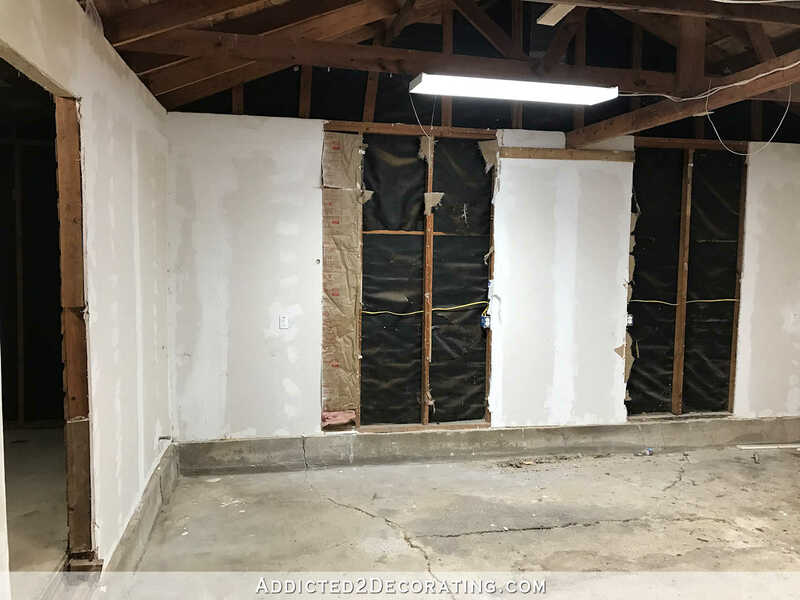 The main goal I had for June was to get my garage and storage room completely cleared out. Completely. As in, there could be nothing at all left in there by the time they’re ready to start on the garage conversion beginning July 5th. My brother and I made lots of progress on that project, and then I went and injured my back and arm and couldn’t finish it up. So I hired some guys to come finish it up for me. BEST DECISION EVER! First they had to clear out and organize the sunroom to make space for the items that had to be removed from the garage. That was a huge project in itself. Then they had to clear out the garage and storage room. They got here at 9:00am on Saturday and were finished by 1:00. I was absolutely amazed at how fast they worked! This is the view from the breakfast room door looking towards the front of the house where my long desktop and two big windows will be. They’ve actually already done some work. The garage doors have been removed, and concrete footings have been poured in those openings. 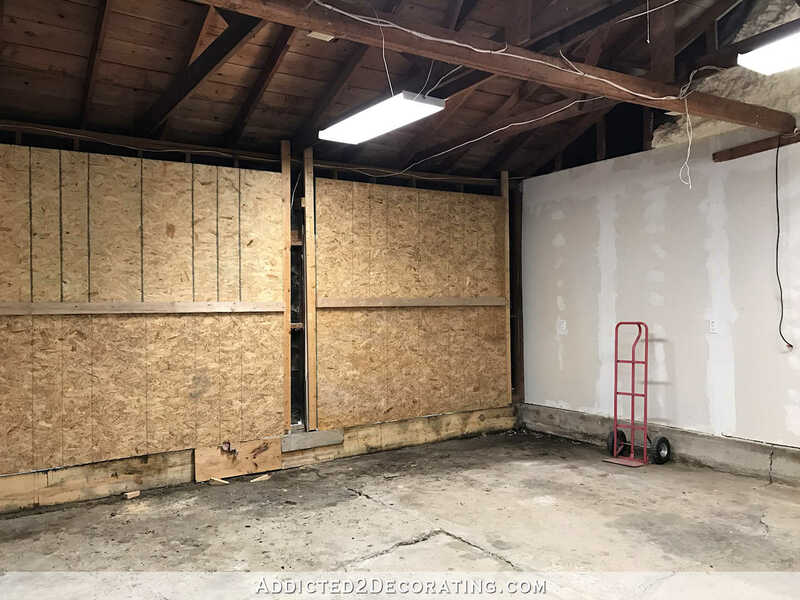 And they cut away the drywall where the door will lead out to the side of the house (where the driveway will eventually be), and the window will go in the “office” area of the studio. 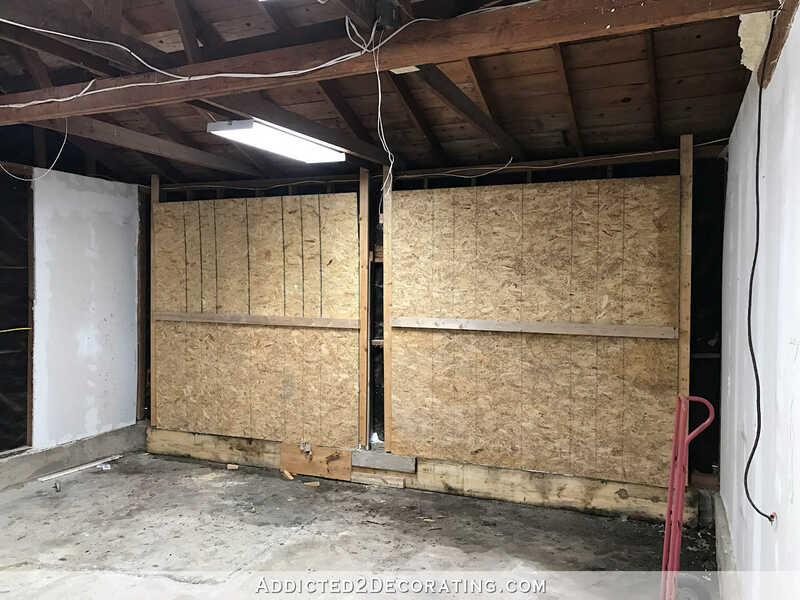 I actually don’t understand why they didn’t remove all of the drywall since it’s sitting on the concrete footing, and they’ll need access to the concrete footing for the floor joists. And standing at the front looking towards the back, this is the current view…. The wall in front (the one with the drywall) will have a 6-foot-wide cased opening in it, and the wall in back (with just the tar paper) will have French doors that lead outside to where the carport will eventually be. And that brings us full circle back around to the wall with the breakfast room door on it. And the storage room in the back is also completely cleared out. The massive furnace has been removed in order to make room for the half bathroom that will go on this side. The pantry is on the other side of that wall. I had considered having water run into the pantry for a sink, but I’ve decided against that. I’ve also decided against having a sink directly in the studio. 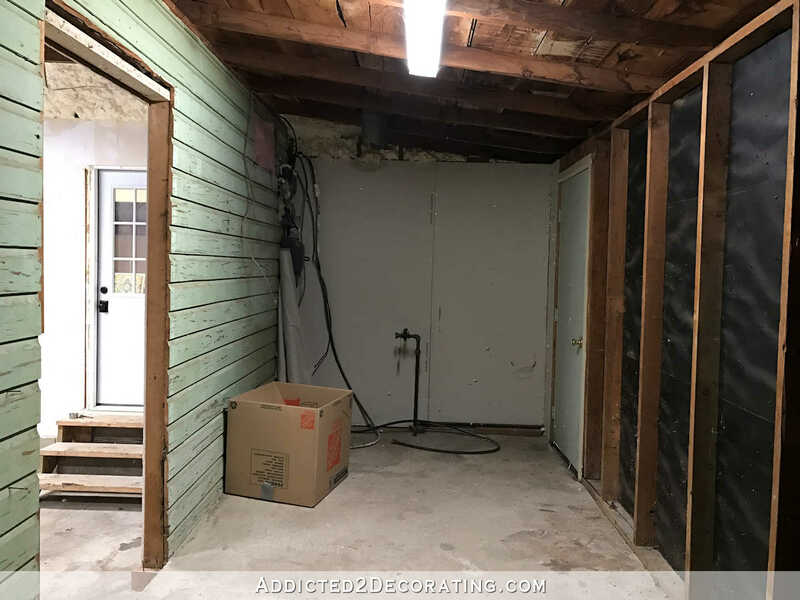 The half bathroom will be just right there, a few steps away through a cased opening and to the left, so I’m going to put a really big utility sink in there instead. And then on the other end of the storage room is where I’ll have a mud room right off of the entry from the carport. I feel like a big weight has been lifted from my shoulders now that the garage and storage room are cleared out and ready to go. And I also got all of my plans for the room drawn out, which has been another weight off of my shoulders. You can click here to see the plans if you missed them. The second biggest item on my June “to do” list was to finish my kitchen, which I did in the first week of June. I still haven’t replaced the glass in the four cabinet doors (I keep forgetting!! ), but other than that, it’s done. You can see more before and after pics here. The garage/storage room and the kitchen were the two non-negotiable items on my June “to do” list. Other than that, I just allowed myself the freedom to work on any creative projects I felt like tackling, and I really wanted to concentrate on walls. I got my entryway and living room painted…again. The light blue I had chosen last year to go with the dark blue kitchen cabinets ended up clashing with the teal cabinets, so I got those rooms repainted BM Classic Gray. 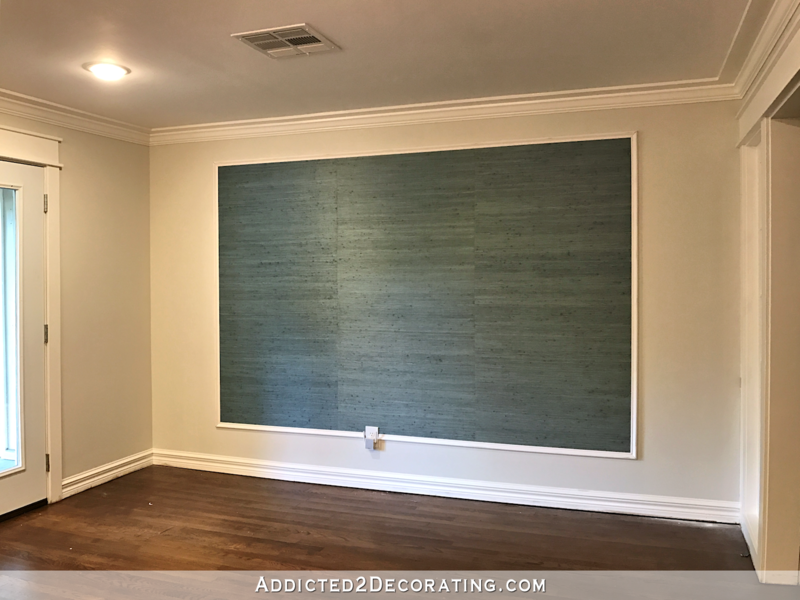 And I also installed the grasscloth accent panel on the entryway wall (more on that here and here). I still haven’t finished up the small areas around the doorways since I’ve been trying to rest my arm and back. So while I did get most of it done, I still can’t cross it off of my “to do” list just yet. As far as creative, pretty, fun projects go, I feel like June was a pretty slow month. But I’m okay with that seeing that the biggest June goal was in preparation for a HUGE remodel to begin in a coupe of days. Other than that, I really don’t know what I’ll actually be capable of doing this month. My back and arm still aren’t at 100%. I’d say I’m operating at about 85% right now, with a bit of pain still in my shoulder and arm, and some general weakness in my arm. The last thing I want to do is push it too hard and re-injure myself. That pinched nerve pain I experienced for five days was excruciating, and I’d rather not ever have to endure that again. 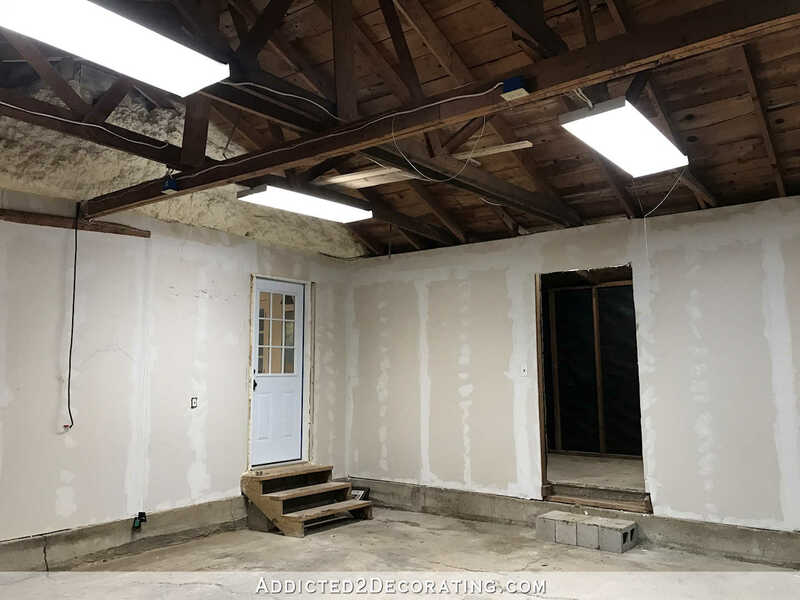 I’m curious…now that the garage will be a finished room, do you plan to remove the exterior door from the breakfast room and replace it with an interior door? Yes, that door will be removed and re-used as the side door in the studio. I’m not actually sure what I’ll do in the opening between the studio and breakfast room. I don’t want a standard interior door, because the door swing will interfere with storage/workspace plans. I’ve considered a door installed on barn door hardware so that the door can slide behind the workroom table that will be pushed against that wall when not in use. But I’ve also considered not even putting a door on there and just leaving a cased opening. As long as I have a way to keep my dog out when I’m working on projects, I don’t really need a door. And a baby gate could serve that purpose. You are definitely a doer and not a spectator. Maybe this is God’s way of having you slow down? You really have gotten so much done. Even if you, personally, aren’t able to do a lot this month there is still so much getting done in your dream work space so take heart. All is well. Breathe. It’s all good and your home is looking amazing! BTW, I sent you a few ideas via Pinterest. Maybe July is the time for resting, recuperating and recharging? You’ve accomplished major goals so this is the time to get ready for the second half of the year. Give your brain time to process and work in the background. You will be up and at ’em soon enough. Congratulations on so many jobs well done! Well done!! You deserve to treat yourself to a more relaxed month. I think you should have someone recover the sofa for you. Remember all the money you saved on the credenza!! Plus, think about your health . . .
Also, it seems like finalizing the pantry plans would be the ideal first project since it’s not physically strenuous. Or, just get a bowl of ice-cream and kick back. 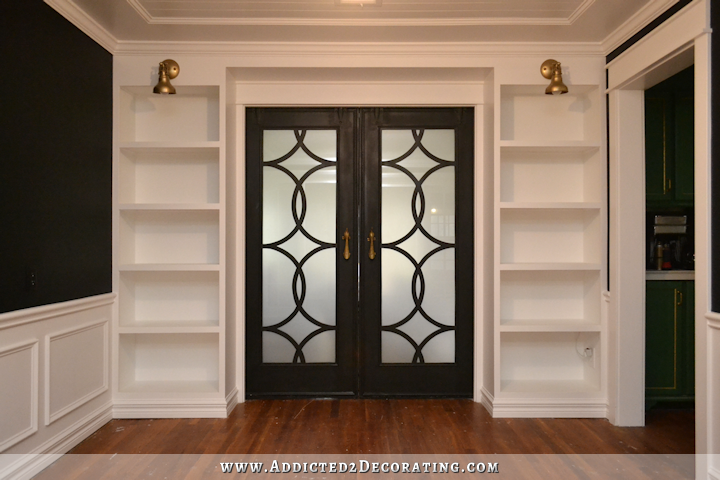 How about pocket doors for the door way from the breakfast room to the workroom? If it were me I would need a way to ‘block the mess’. I am not always the neatest when working on things. Right now I am putting the poly on which will soon be floating shelves in my daughters bathroom. There are wood, brushes, stir sticks, sandpaper, screwdrivers, nails and my drill all laying around in my office/work room (yea, not ideal). It is nice to be able to close it off. My sewing machine is currently sitting on my dining room table with quilt blocks, patterns and sewing supplies all spread out. I wish I could close a door and hide all of it but since it is open to the family room all I can do it look at the mess. And so does anyone else who walks through the door when I am quilting. You have done so much beatiful work this year. Take some time off and heal, you are making great progress. It has been a fun and inspriring year to ‘watch’ unfold. Maybe plan out how you want the mudroom, pantry, and hall to be laid out. Consider different colors flowing into each of the spaces. I also saw that someone mentioned you hiring out the reupholstery since you saved on the credenza – if that’s an option I do recommend that too. As another idea you could do a half Dutch door (?) kind of like a built in baby gate. It could open towards the table to save your benches. It would keep out the pup pup but not hinder matt. I know you said a door wouldn’t serve your purposes but maybe this is different? I love the idea of a rolling barn door between the breakfast room and your studio, as it will take a lot less room, but you’ll be able to close the area off completely, e.g. when you paint something smelly… or is that going to be a kind of project that will only be done in your workshop/shed when that’s finished? I, too, recommend resting and recuperating for the time being, as it is so discouraging when the pain comes back because you started working again too soon…. and you can do some planning, dreaming and eating icecream (great idea :)) in the meantime! as well as hovering – I couldn’t imagine not doing that while somebody else is working on my house! 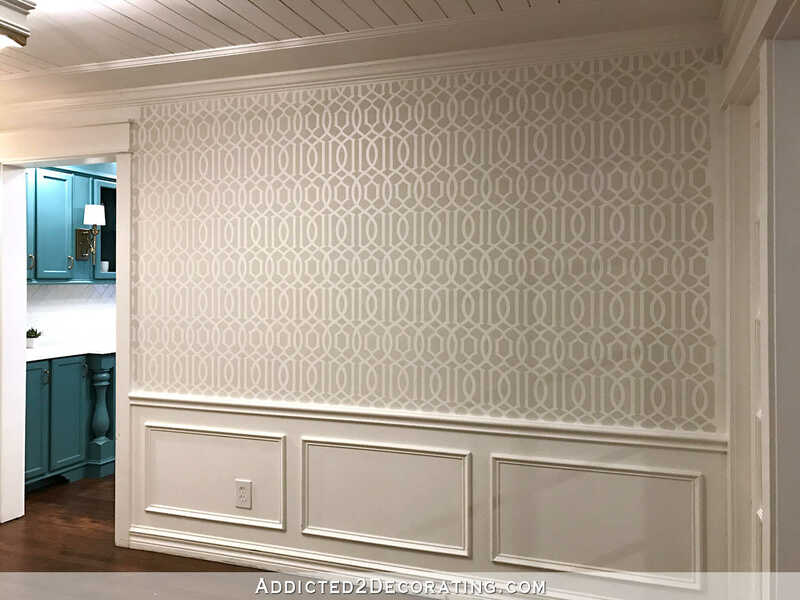 The newest show to appear on HGTV is Addicted to Decorating starring Kristi! Your work is amazing and needs to be shown to millions, keep up the outstanding accomplishments! Yup, continue to be kind to yourself, give yourself the time to heal and focus on the stuff that doesn’t require so much back and arm stuff. The rest will still be there when you’re 100% again. Great job! Can’t wait to see your progress! Bet they work fast. I think a dutch door might be your best choice for between rooms door! Happy Independence Day to you all, and your blog followers! I have a question about the vinegar/steelwool stain. What do you use over it for a seal? Poly or what else would work? I have a couple of pine boards 1″X 8″ that are shelves, and the stain is very flat looking as it dried. Need to get this done, but not sure what I can use over the vinegar, or if it is even a problem. 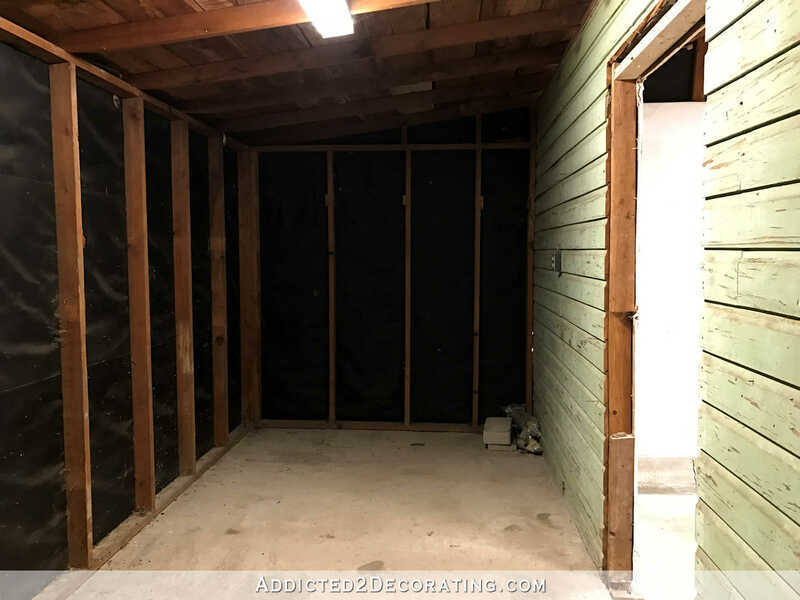 This is a rustic bathroom cabinet set in the wall between studs, the pine boards are the top and bottom shelves that set out into the room a bit. It was amazing to use, as it was almost clear going on, then turned dark quickly as it dried to a very flat neutral brown. Thanks for any insite you can give! I agree with everyone who is urging you to rest and guard your health. Hovering is strenuous! I appreciate the knowledge, expertise and work ethic of professionals but it is a pain to have strangers in your house for weeks or months. Sometimes us at-home folks don’t get our showers by 7am and here come all the pros to start their work day and you need to hover or be available for decisions. It can be difficult to feed and walk your pets or even maintain a train of thought. When you have an appointment outside the home all of a sudden they have a million questions or look to be about to do something wrong. Don’t get me wrong, I love a contractor who communicates well and tells me when I have a decision and the implications of my decisions. It’s just that you become their unpaid (or paying) full time colleague for the duration of the project. He works for the GC that’s doing the garage conversion/remodel. Chuy is the project manager in charge of my project. Do you plan to raise the floor level of your studio? I can’t remember what type of flooring you plan to use in there. Very excited to see that area get started!! I hope you feel 100% soon! The studio floor will be raised to the level of the breakfast room and storage room. I haven’t decided on a flooring yet. The hardwood flooring I’ve been using throughout the house would certain be the easiest option, but it’s also pretty expensive. Might be worth it, though. #1 goal for July: recoup and heal your arm and shoulder. It’s summertime, take a mini-vacation! Kristi, I would live the drapes and the sofa for when the studio is ready 🙂 Imagine how convenient it would be to do these things there. As for you back pain – I used to have the same problem, pinched nerves on regular basis, and twice it was quite debilitating with awful pain. I took the medicine, prescribed by my GP and went to see a chiropractor, but I also realized that all these incidents happened after I’ve done some physical activities and had a rest while warm and sweaty. The solution to the problem is a medical belt made from thick jersey fabric, which I ware when diying, gardening, doing sport, etc. It keeps my back warm and also provides some support. And I keep a big scarf in my car and wrap it around the back of my neck when driving. No back/neck problems whatsoever since I started doing this. Maybe such simple things can help you too. Please, take care of yourself. This is all coming together so nicely! What about a trough sink in the half bath instead of a utility sink? I agree with most of the comments – you should make R&R a part of your July goals. (and getting glass for the cabinets!) If you don’t heal completely, your work can suffer and you will then have to create loftier goals each month to make up for injuries. You can’t be useful if you aren’t healthy! Rest, and have a happy, calm 4th! I wouldn’t push too hard this month. I’ve had pinched nerves in my hip and in my neck before and they are not fun. Take time for it to heal. You can use July to finish a couple of “artsy” projects and make plans for August. Take a breather and look after yourself that’s important. You are simply a wonder woman with what you achieve.🤗 Everything that you have done is truly beautiful. Pour a cup of tea and ponder over house magazines,or pin interest. Gosh, I think you’ve accomplished a great deal this year. You’ve been moving at a good clip! May I recommend physical therapy? I’ve found they’re incredibly good at getting a body back in order without risking re-injury. It just occurred to me that your pinched nerve problem was probably similar to mine. Last September (for about a month!) I had sciatic pain. In my case, I could barely walk!! Thank goodness my dh was here to help (when he wasn’t at work). I had to use crutches to walk for about a week. Try carrying a cup of coffee up a flight of stairs (it’s where my desktop is) while using crutches. So anyway, my point is, Matt can’t really help you, YOU have to able to help HIM, so yeah, you better not push it. Everything you’ve done up to this point is so pretty. I’m not a big fan of painted kitchen cabinets period, but both your kitchen and breakfast room are so pretty! !